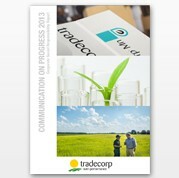 Following the commitment we acquired when joining the Global Compact, we present now our Communication on Progress for 2013. In this report, we explain the main features of our Corporate Social Responsibility policy and describe the main actions that have been carried out in 2013 in relation to the 10 principles in the Global Compact initiative. Global Compact: Tradecorp’s Communication on Progress 2017 is now available!